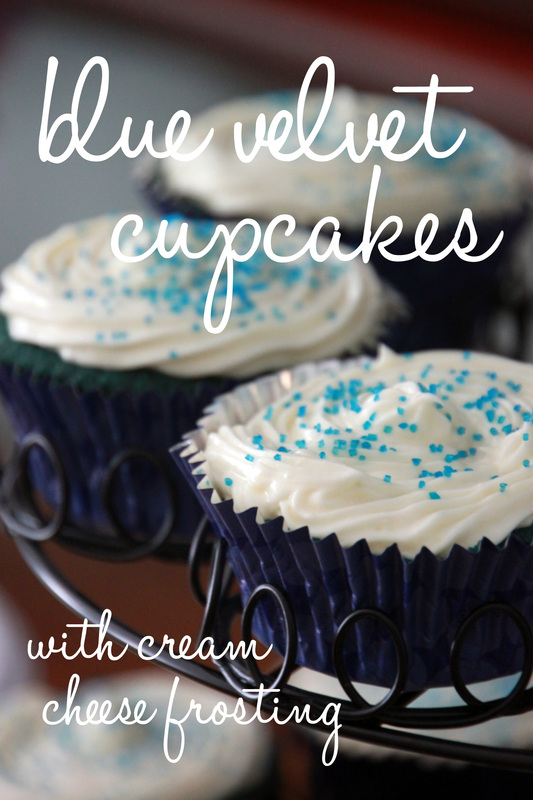 Blue velvet cupcakes — a twist on a crowd-pleasing favorite | write meg! 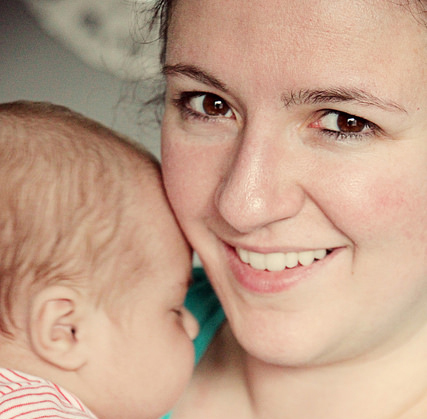 When we learned my dear friend Erin was expecting (congrats, Erin and Matt! ), I was happy to don my apron to create baby shower treats. A request came in for blue velvet cupcakes, a variety of that red-colored favorite, but I got a little nervous peering at the directions . . . mostly because the recipe calls for buttermilk, white vinegar and a variety of other things I’ve never baked with before. My fears were unfounded, however; though a bit time-consuming, these weren’t tricky. And while I liked the cake and dug the dark-blue hue (a bottle of food coloring will do that), the highlight was the homemade cream cheese frosting. I’m typically the type to shuck the top of my cupcake off and pass the frosting to someone else . . . but none of that was going on last weekend. I wanted the cake and the frosting, and you’d have had to pry them out of my greedy little paws. If you’re a fan of red velvet but want something a little different, allow me to recommend this fab recipe from genius baker Heather at Sprinkle Bakes. And with the Fourth of July just days away, you could give these a patriotic makeover with red and blue sprinkles. My notes: Though I prepared these mostly as instructed, I made two separate batches to get the 36 I needed for the baby shower and found that the batter into which I’d spilled extra vanilla extract were tastier than the other set — so I upped the vanilla and cocoa powder (could have used a little extra varoom!) in the version below. Also, I lowered the recommended baking time; at the 25-minute mark, mine were very browned and, um, “well done.” Just keep an eye on ’em. 1. Preheat oven to 350 degrees F. Place cupcake liners in pans. 2. In a mixing bowl, cream the sugar and butter, mix until light and fluffy. Add the eggs 1 at a time and mix well after each addition. 3. Mix cocoa and food coloring together to form a paste, and then add to sugar mixture; mix well. 4. Sift together flour and salt. Add flour mixture to the creamed mixture alternately with buttermilk. Blend in vanilla. 5. In a small bowl, combine baking soda and vinegar and add to mixture. 6. Pour batter into cupcake papers. (Batter will be thick!) Bake for 23-25 minutes, or until a toothpick inserted into center comes out clean. Remove from oven and cool completely before frosting. In a large mixing bowl, beat the cream cheese, butter and vanilla together until smooth. Add the sugar and on low speed, beating until incorporated. Increase the speed to high and mix until very light and fluffy. Frost cupcakes and embellish as desired. 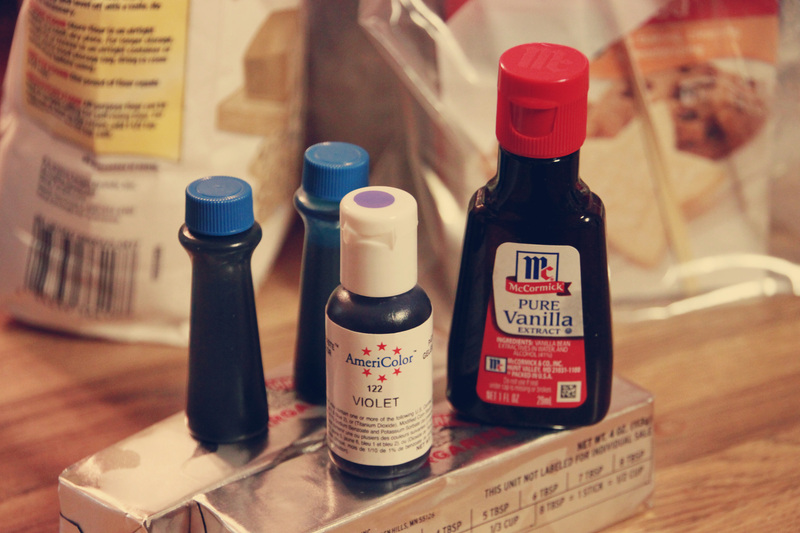 I’ve seen red velvet cake recipes with vinegar in them. Your cupcakes are beautiful but I’m not a fan of anything that has a whole bottle of food coloring in ti. Wow! They are sooo bluuuue. They are lovely looking. Ha — that’s awesome! Surprisingly, no; all tongues were normal-colored. I was actually concerned that everyone would have blue teeth for the rest of the day, but no staining was involved. Now, when I licked the extra batter the night before? Different story . . . I hate the taste of red food color, so I think I would prefer blue velvet. SO totally cute and clever. Well done! I’m trying to work out how using vinegar in a cake would work! Other than that though, they sound great, definitely an interesting variation on an already yummy recipe. Glad the spillage worked in your favour! I have never heard of blue velvet before. What a great idea! I love these! Just in time to mix up a batch for the Fourth of July. Thanks for sharing. These look so yummy! And such a cute spin on a classic favourite; can’t wait to try these out for myself 🙂 thank u for the recipe! What a lovely variation to the classic red velvet cupcake! The vinegar must have added s slight sour note. I love the way you have decorated the cupcakes. Congratulations to the parents-to-be! I love the little whale toppers! These look delicious. Thanks for sharing! Megan, your cupcakes look beautiful!! Can’t wait to try them out. Got any ideas for pink ones?